The workshop started on Thursday morning for new and interested partners willing to join the EUscreenXL consortium, and continued in the afternoon with talks by Eve Oesterlen from British Universities Film & Video Council, in charge of aggregation and enriching content (WP2) about the light and dark side of the EuscreenXL project when it comes to gathering content. Within the project’s duration EUscreenXL aims to add 20,000 items of high quality, enriched, and curated content to the existing 40,000 items. It will also aggregate and deliver a further 1 million metadata directly to Europeana. Eve illustrated with the help of case studies, why – with such a complex process in place – it’s vital to plan ahead, check submitted data and content, invest in accurate and timely reporting and stick to delivery deadlines: these seemingly small things will have a massive cumulative impact on the project outcome. The last speaker of the day, Chiara Latronico (Europeana Association), presented interesting and in-depth insights into the ingestion workflow at Europeana. She showed how the matadata is “made”, and by comparing the minimum of data necessary for approval with an example of metadata “done right”, she illustrated the importance of creating rich records that may better serve the needs of a user and thus also bring more visibility to the providing institution. At the end of the day we were given a tour of LCVA. On Friday EUscreenXL’s technical partners spoke about the new portal’s front-end development. Daniel Ockeloen from Noterik covered the work being done with current portal development, while Erwin Verbruggen from Sound and Vision talked about security issues aiming at providing high security standards on the EUscreen portal. Eggo Müller from Utrecht University, EUscreenXL project Co-ordinator, spoke about user engagement pilots, the road ahead and the importance of reaching aggregation goals. The user pilots were developed to target key user demographics to further understand their needs and draw conclusions about their interaction with EUscreen. The first pilot, about general users, illuminated the importance of focusing on contextualized or featured audiovisual content and manual translations. The second pilot showed how researchers need powerful search tools and that they want to easily store, curate and share search and research results. The pilot targeting creative industries and collaborations with external partners showed EUscreen’s potential as an online museum. Maria Drabczyk (National Audiovisual Institute) talked about the upcoming EUscreenXL final conference in Warsaw and co-operation with external partners such as Historiana – an online platform for history education. Maria announced the title for the Warsaw conference. We will meet in Warsaw on December 3 and 4 to discuss “Content in Motion: Curating Europe’s Audiovisual Heritage”. On external collaborations, she showed how Historiana is a perfect partner for EUscreen as it offers a transnational approach to the past, encourages multi-perspectivity in history, and promotes active learning and historical thinking. These are all shared beliefs between the two projects, and therefore they decided to join forces and create online teaching materials using unique AV footage. Afterwards, Yashar Dehaghani (EUscreenXL Communication Specialist) gave a presentation of the most recent analysis of traffic data, and talked about current and future dissemination activities and new editorial and social media strategies. Some noteworthy points were that both general and social media references to EUscreen.eu are up by a significant margin, that the site has increasingly more mobile users, and that the site has seen more than a quarter increase in the number of sessions since the last period of 2014, and a full one third more users. At the workshop on Friday, arranged by the team of partners working on the publication tools for EUscreen.eu (Aalto University, Utrecht University and Noterik), dissemination and social media was in focus. We got to discuss whether the proposed tools were fit for purpose. We also got to try small tools for curating and showcasing EUscreen content. 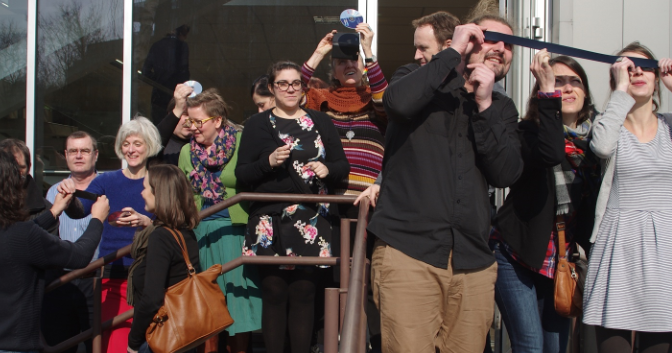 And of course we took a break to catch a glimpse of the eclipsing sun. And finally, a huge thank you from everyone at EUscreen to Inga Vizgirdiene, Jolè Stimbirytè and the LCVA team for their work in organizing this very successful workshop in Vilnius!